With the release of the final estimates of second quarter 2015 GDP growth (revised up to a 3.9% growth rate), housing’s share of gross domestic product (GDP) declined slightly to 15.31%. However, the home building and remodeling component – residential fixed investment – expanded for the third consecutive quarter to 3.21% of total GDP. For the second quarter, RFI was 3.21% of the economy, reaching a $524 billion seasonally adjusted annual pace (measured in inflation adjusted 2009 dollars). This is the highest quarterly rate for RFI since the first quarter of 2008. The second quarter growth for RFI added 0.3 points to the headline GDP growth rate (i.e. GDP would have expanded 3.6% absent the RFI contribution). 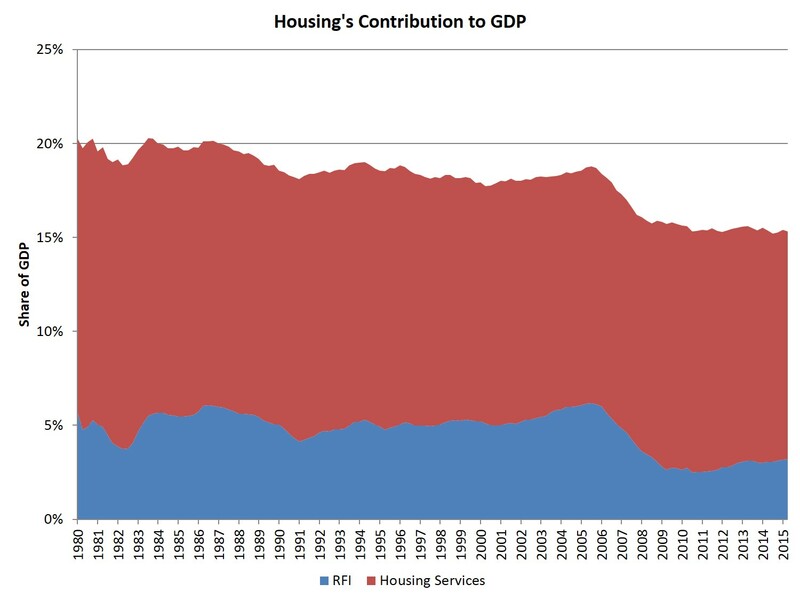 The second impact of housing on GDP is the measure of housing services, which includes gross rents (including utilities) paid by renters, and owners’ imputed rent (an estimate of how much it would cost to rent owner-occupied units) and utility payments. The inclusion of owners’ imputed rent is necessary from a national income accounting approach, because without this measure, increases in homeownership would result in declines for GDP. For the second quarter, housing services was 12.1% of the economy or $1.98 trillion on seasonally adjusted annual rate basis. Taken together, housing’s share of GDP was 15.31% for the second quarter.